This angel embodies the principle of unconditional love. He urges you to love yourself, warts and all, in order to be capable of loving others. The more you love and respect yourself the more others will love and respect you too. 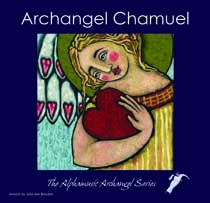 Chamuel asks you to look deep into your heart and release any negative emotions that you may be harbouring. Call him if your heart is full of negative emotions such as envy, guilt, bitterness, or a lack of forgiveness. Chamuel reminds you not to be controlling, possessive or clingy; giving the person you love the freedom to be who they are. Remember pure unconditional love can lift you from the depths of sorrow. He will help you move on from past relationships or heal any rifts in current ones. Increase self-fulfilment by noticing what is good in your life right now and finding more ways to express your love in life. Let beauty infuse your life and your spirit. When you open your heart to the unconditional love of the Universe you experience love and gratitude. You can invoke Chamuel to connect you to this love and to use it to overcome your fear. Fear of cruelty and pain.